JK 4-Dr Rocker Knockers Body Mounted for Jeep Wrangler JK 2007-2016. The Most vulnerable areas on the body of the Jeep JK are the rocker panels. Poison Spyder Rocker Knockers protect your JKs rocker panel area while enabling you to slide over rocks and obstacles. Rocker Knockers enhance your Jeep trail performance while adding rugged off-road looks to your JK. Poison Spyder JK Rocker Knockers are engineered for brute strength and impact resistance by attaching to the Jeep body in 14 strategic bolt locations. 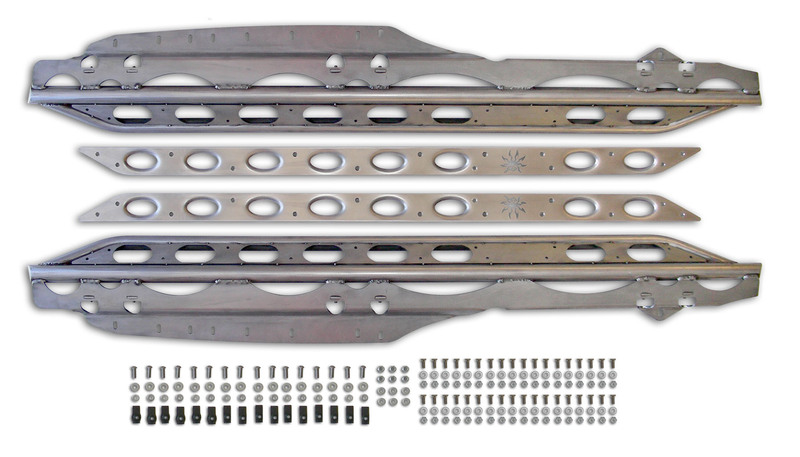 The mounting plate is CNC laser cut from 3/16 inch plate steel and precision brake-formed for a perfect fit. The tubular rocker rail is rugged 1.75 inch X .120 wall DOM structural tubing. The slider rail is fabricated from CNC-bent 1.5 inch X .120 wall DOM tubing. The space between the Slider and the main tube of the Rocker Knocker is filled with a CNC laser-cut Slider Skid. The Skid features Poison Spyder exclusive oval dimples for structural strength as well as great Poison Spyder looks. The Skid attaches with countersunk stainless steel flat head cap screws for a flush surface. The Slider and Skid mount at an angle to the main tube of the Rocker Knocker to provide boatside-like protection from the rocks while keeping the Jeep doors and body a safe distance from higher level trail hazards. ANother quality element of the Poison Spyder Rocker Knocker is the ability to remove the outer slider skid. The outer skid is built from 1/8 inch steel and is secured to a 3/16 inch base plate welded into the slider hoop assembly. The Slider does Not rely on the skid for structure. The advantage of having the ability to remove the skid, is to allow you to replace it if it becomes damaged to a level that it has lost its aesthetic appearance or functionality. Also you will be able to customize the Sliders to match your Jeep, and to easily be able to remove it for re-finish. Poison Spyder JK Rocker Knockers are compatible with all known suspensions and body lifts, including long arm kits. Because the Rocker Knockers mount directly to the Jeep body tub, they will lift with the body when a body lift is installed (competitor frame-mounted rocker guards may leave a gap on body-lifted vehicles). As an added attribute the Rocker Knocker mounting plate is designed with drain reliefs to discourage debris from collecting in the lower body cavity. Poison Spyder JK Rocker Knockers can be utilized as a stand alone component or can be used in conjunction with Poison Spyder's JK Body Armor. JK Body Armor is a secondary line of defense against off road damage to your Jeep, protecting the Jeep by reaching above the Slider level up to the door line. Rocker Knockers do Not mount or use the Body Armor for additional structure.